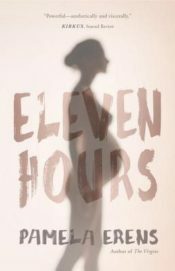 In her new novel Eleven Hours, Pamela Erens unpacks the fearful anticipations of becoming a mother and the painful process of losing one. The story centers around two pregnant thirty-year-olds: Lore, a single elementary school worker who enters a New York City hospital, alone, to deliver her first child, and Franckline, the hospital obstetrics nurse who cares for her. Erens seamlessly moves the narrative between the two women as though the emotions, thoughts, and actions of one also belong to the other, amplifying all they share in common—pregnancy, loss of a mother, and overwhelming feelings of grief, guilt, and superstitious pessimism. The universe cannot be good. A good universe could not include the forcing of her child half inch by half inch down the birth canal, its soft head squeezed misshapen by the hugging walls; could not include her own grotesque and agonized prying-open. During long hours together with little to do but await and respond to Lore’s labor pains, Lore and Franckline share nothing about their personal lives: Lore does not know that Franckline is pregnant, and Franckline is left guessing about the reasons why Lore is in the hospital without friends, family, or the baby’s father. Yet an intimacy develops, one that is somehow more than just the perfunctory trespass of modesties and inhibitions between patient and nurse. It is a closeness rooted in Franckline’s ability to intuit Lore’s fears because they are her own. A fatalistic outlook grips both women. Lore drafts a twenty-page “birth plan,” a medical directive for herself and her baby that is less about her empowerment to dictate terms for care and more about her belief that something is certain to go wrong. A menu of horribles about her own pregnancy likewise haunts Franckline, so much so that she is keeping her four-month condition from her husband to save him grief and disappointment if she miscarries. These fears are rooted in a shared history: the withdrawal of maternal support and affection when Lore and Franckline both were quite young. This underlying theme of losing a mother enriches Erens’ story about the two pregnancies, because this shared legacy magnifies to the point of distortion the women’s perceptions about the ephemerality of love and life. Lore had never known anyone who behaved the way Julia did, who went directly to the important thing, and enabled you to talk about it too. So that you never wanted to go back to the ordinary type of conversation, which was all mask, all a way of never figuring out what really wanted to be said. And how stupid and arrogant Lore had been, to believe that she could take her pleasure of both of them, yet Asa could remain completely her own. The bliss, for so long, of that self-deception. Julia and Lore spooning atop a pile of coats at a party, dozing, while Asa talked on in the living room. Or Asa would say something that annoyed Julia, and Julia, slender Julia, would tackle him; he’d fake a fall, Lore would pile on. They’d roll and punch at each other like preschoolers, laughing, grabbing hair, baring teeth. Asa’s hand on Julia’s belly, Julia’s fingers grazing his mouth: were these knowing promises of what would be redeemed on another day? Throughout this beautifully written novel, Erens explores the complicated emotions that connect women and those that can pull them apart, even severing a bond that should be indestructible like that between a mother and her daughter. There is a heavy dose of anguish in these pages and Erens describes this pain so honestly that its rawness is breathtaking. Unfortunately, in a dozen or so pages near the novel’s end, Erens veers away from her tiny cast of mostly female characters and puts us inside the minds of a few of the hospital’s doctors, an abrupt shift that feels disconnected from the narrative. But this is a rare false note in Pamela Erens’ brilliantly evocative novel. This entry was posted in Uncategorized and tagged Summer 2016 on July 18, 2016 by Kelly.